Presbyopia is an age-related long-sightedness, which affects your ability to see objects close up. It occurs when the lens loses its flexibility. Learn about this eye condition, why it occurs and what you can do to treat it. It is the lens’ flexibility that allows you to focus on objects at different distances, but with presbyopia focusing becomes more difficult. 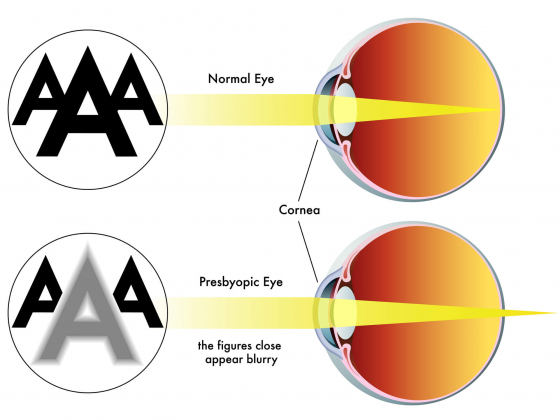 Along with Myopia, Hypermetropia, and Astigmatism, Presbyopia is part of a group of eye-conditions defined as ‘refractive errors’ – the shape of the eye causes light to incorrectly focus on the retina. Presbyopia is a normal result of ageing – as you get older, your lenses become harder and the surrounding muscles become weaker. This means it is more difficult for the lens to focus at different distances, and instead focusing the light behind the retina, making it harder to see objects up close. The Cornea and Lens – These are at the front of the eye, helping to focus light directly onto the retina in a similar way to a camera lens. The Retina – This is a layer of cells at the back of the eye that works by sensing light and colour before converting them electrical signals. The Optic Nerve – The nerve that transmits electric impulses to the brain where they are interpreted. The lens works by evenly refracting light and focusing it onto the retina, letting you see objects clearly. With objects of different distances, the lens is able to change its shape to bring them into focus depending on how far or near they are – if the objects are far away the lens flattens, if the objects are close the lens becomes round. The lens is also surrounded by a muscle that helps it change shape, contracting or expanding depending on the distance of the object you are looking at. When you have presbyopia, this flexibility is lost and the muscles become weaker. As a result, the lens’s focusing power is reduced, and your vision can deteriorate when looking at objects close up. Presbyopia can normally be diagnosed in a routine eye exam – this can involve testing your visual sharpness, the ability to adjust your focus to different distances, and the state of your eye muscles and retina. Adults should have their eyes routinely tested every two years unless they have been told otherwise. These normally take 20-30 minutes at an optician and involve having your eye health examined as well as your vision. An optometrist will get your medical history and ask about any symptoms you may be showing, such as any issues you are having and how long you have had them. They may also ask general questions about your lifestyle, health, and any medication. The first exam will look at the health of your eyes. 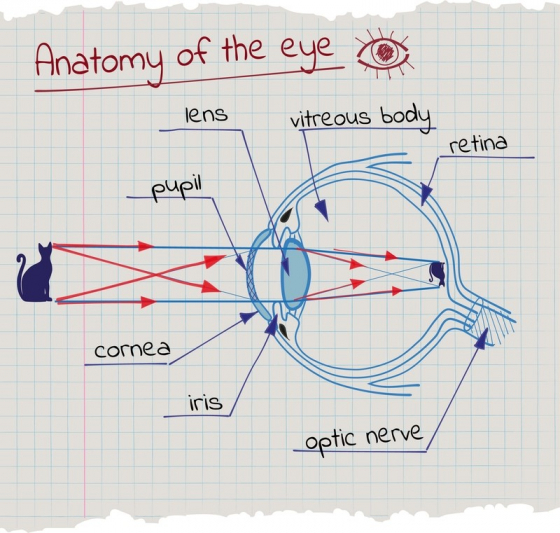 The optometrist normally shines a torch known as an ophthalmoscope through your pupil to check the inside of your eye and test how your pupils react to light. They also check co-ordination and movement of both eyes to make sure they are working together. They may also test for other conditions depending on your medical record and age – these can include Glaucoma (changes in eye pressure possibly damaging the optic nerve) and Diabetic Retinopathy (high blood pressure and high blood sugar lead to new blood vessels, which may cause vision problems). After having your eye health checked, you will normally have a vision test. 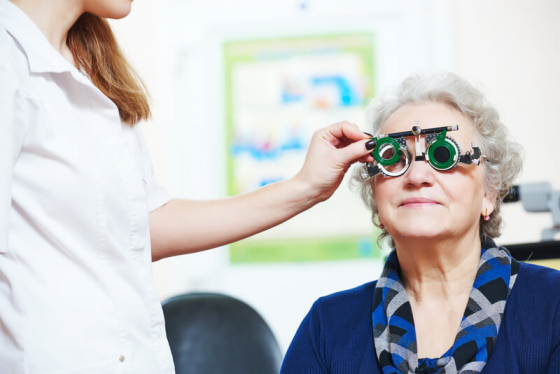 This involves examining your distance vision, near vision, and intermediate vision, as well as your visual acuity - you often read from a Snellen chart (each line of letters becomes smaller). If you wear glasses or contact lenses, you may be tested with and without them. Further examinations may be carried out to discover the extent of the condition, and what corrective lenses may be needed. How do you treat Presbyopia? As presbyopia is a condition relating to the lens rather than the cornea, laser eye treatment isn’t usually effective - it is normally treated by wearing corrective lenses, such as contact lenses or glasses. In cases where patients struggle with corrective lenses, they may be offered surgery to implant an artificial lens. Prescription glasses work by focusing the light directly onto the retina, giving clearer vision. The lenses are normally a convex shape, where they are thicker in the centre and thinner at the edges, but the thickness, curvature, and weight depends on the severity of your condition. As Presbyopia is an age-related condition, it can become worse as you grow older. This may mean the strength of your prescription lenses will increase, therefore it can be important to keep having regular eye-tests. It is also possible to become both short and long-sighted with age, and if this happens you may require another pair of glasses. You can also buy bifocal or varifocal lenses that help you see things in the distance as well as close up in one pair of glasses. Contact lenses function like glasses, however, they are lighter and practically invisible. 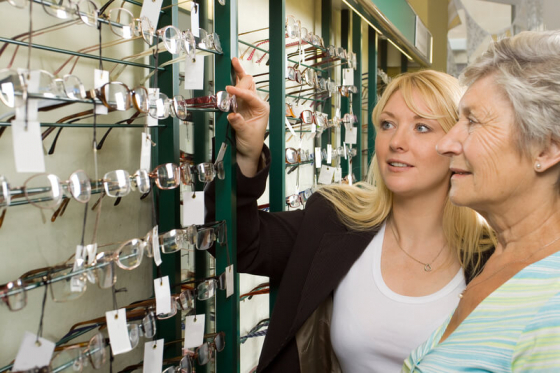 They can come in various forms – some are only worn for a day before you dispose of them, while some can be cleaned and reused – and your optometrist will be able to advise you on the different options. As they are discreet they can be an attractive option, however, they can also increase the risk of eye infection, which makes it important to maintain contact lens hygiene. For people who find it difficult to use glasses or contact lenses, there is the option of a presbyopic lens exchange (PRELEX). PRELEX involves cutting a small flap into the cornea and inserting an artificial lens to correct the focus – the flap is folded down without using stitches. After the surgery, you may be prescribed corticosteroids, antibiotics, or artificial tears. PRELEX treatment is a newer form of treatment for presbyopia, therefore there is little evidence that it is safe in the long term – you should discuss the risks with your doctor or optometrist.